Did you know that this week is Protect Your Identity Week? Identity fraud seems like a rather timely theme for the week leading up to the nation’s second most-popular holiday, noted for widespread trickery, mayhem and identity assumption. All levity aside, Halloween holds a fair amount of risk, so here are some risk reduction tips for the homeowner, the employer, and all the little monsters. And a word to the wise: don’t forget to update your Zombie Insurance. While we can’t do much more in the way of protecting your from monsters, ghosts and zombies, our contributing bloggers have submitted some excellent posts to help you tame some very real-life risks. Without more ado, I give you the pre-halloween edition of Cavalcade of Risk. At his eponymously named blog, Seth Godin explores the difference between “apparent” risk and “real” risk; the distinction’s real, but not necessarily obvious. Why would someone worth more than a billion dollars risk it all for a little extra gain? At the DailyFinance blog, Peter Cohan explores risk and reward through the cautionary tale of a hedge fund manager who put his own net worth in jeopardy for an extra few bucks. Do cheaper goods and lower prices put us at higher risk? At The Digerati Life, Silicon Valley Blogger explores how the monetary tradeoffs we make can have some unintended – and sometimes distressing – consequences. And for more on the consumer front, Patrick at Cash Money Life offers tips to mitigate your risk of being a victim of common consumer scams in his post on the top 10 consumer complaints and how to protect yourself. Between October and December, some risk runs on four legs. That’s when more than half of all deer-car collisions occur. Check the likelihood of hitting a deer by state at Consumer Insurance Blog’s post Seasonal road hazards: deer, moose and other ruminants. What’s in store with health care reform? With the Baucus bill is out of committee, Joe Paduda of Managed Care Matters takes a look at things from here. In looking at some recent developments, Jaan Sidorov of Disease Management Care Blog wonders if the rhetoric might be getting a little extreme. Do you need an H1N1 vaccine? Jason Shafrin of Healthcare Economist presents some guidelines and resources about who should and shouldn’t get the vaccine. In a related matter, see his article Delivering Vaccines: A Case Study of the Distribution System of Vaccines for Children, recently published in the American Journal of Managed Care. David Williams of Health Business Blog looks at leftovers hiding in the medicine cabinet, and talks about the potential risk they may pose to teens. At Risk & Business, Chris MacPherson makes the business case for getting employees back to work quickly to keep workers comp costs down. 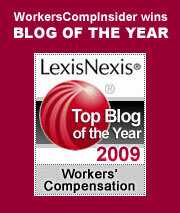 And on the topic of keeping workers comp costs down, see our post about reducing fraud. Amy Hatch, blogging at Parent Dish, reports on a new study which seems to indicate that parents who drink and co-sleep with their babies increase the risk of Sudden Infant Death Syndrome. Ironman at Political Calculations has created a tool for working out how much term life insurance a person might need while also discussing how factors like the amount of replacement income and debts to be paid off might influence how much insurance coverage you choose to get. If you are one of the 9.7% of the workforce that is unemployed, you might be among the many who are turning to independent contract work. Jim Rose offers suggestions for affordable self-employed health insurance at Blueprint for Financial Prosperity. Do you need disability insurance? At InsureBlog, Hank Stern uses the real-life experience of a relative to uncover some of the weaknesses and limitations of Social Security Disability as a safety net. In some additional posts related to the theme of “should I or shouldn’t I,” Freemoneyfinance offers some guidelines to help you determine whether or not you need long-term-care insurance, and Tom Drake offers his thoughts on whether or not you need rental car insurance. This entry was posted on Wednesday, October 21st, 2009 at 9:02 am	and is filed under News roundups. You can follow any responses to this entry through the RSS 2.0 feed. Both comments and pings are currently closed.